This is a M1 Timeframe EURUSD Scalper that selects intelligently when to enter the market and when to exit if things go wrong. Do not hesitate to download Demo and try. As I say works best on M1 EURUSD chart. Minimum deposit is 100$ and will work on Zero Spread or ECN account with very Small Spread. No problem with commission as high as 10$ per RoundTurn Standard Lot. It does not use grid or hedge but it does have a moderate use of Lot Increase after losses for recovery of loss purposes, The EA have been studied to not have more than 5 consecutive losses. Works on VPS best, and Slippage is fine, It uses fairly high take profit and Stop level values. Other symbols and standard accounts are accepted. Specially recommended low Spread Currencies. The standard or Default set is provided with an internal algorithm and values are fixed internally. Only Money Management Variables are provided. Please feel free to contact me if you have any doubts. Sets are provided in the comments section. Please do not open trades Manually in the same account as the one used for using this EA. Use only one instance of DeepScalper per Account. Period for Indicators: The Integer number period for the indicators used in the entry algorithm. Period for MA filter: Period for the Moving Average filter to determine trend direction. ATR max pips in Points: How big can the average true range be to open trade. MAX MIN CCI: to open a trade CCI must first reach this value in the current TF. 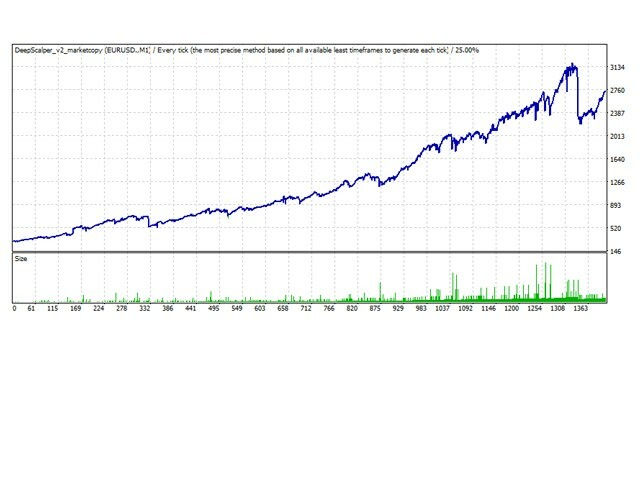 Risk Value: This is the max percentage of possible loss in the initial trade. In per cent per trade. Max Increase Number of Times: The lots are increased by factor in case of loss, max of X losses. Then reset to initial state. Spread filter: Max Spread allowed to open trades. If Spread at the moment of opening a trade is above this value if will not be opened.